Season cooked quinoa with salt and chilli and then spread the quinoa thinly over the nori sheet but leave about an inch clear at the bottom. Make sure you don’t use too much quinoa and leave room for it to expand when rolled. Lay out your chosen filling in a thin line across the sheet and start rolling from the top. 4. 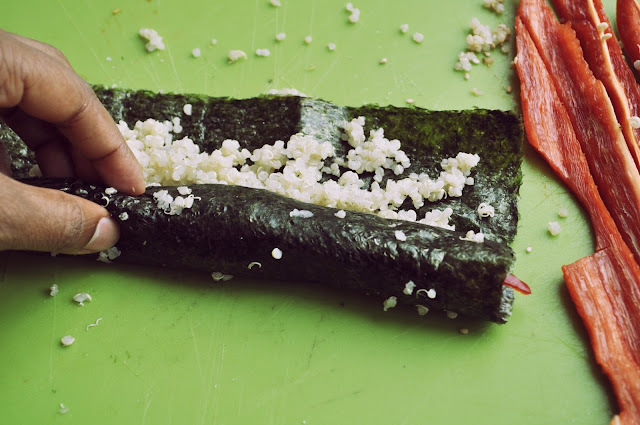 When it is rolled use a bit of water to make the nori sheet stick. 5. Take a sharp knife and slice 1 inch rounds. 6. For the austrian twist drizzle a bit of pumpkin seed oil and balsamic vinegar on it. Done!